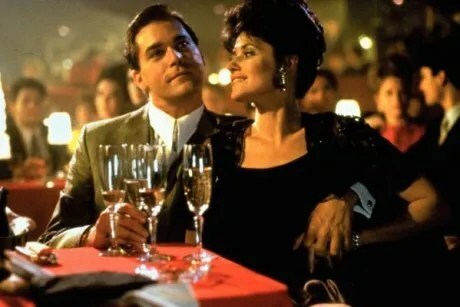 Goodfellas, The F*cking Best Movie Ever Made. Open Thread. It’s been 25 years since “Goodfellas” was released in 1990 and yet the film still remains a favorite. Well, it is my favorite anyway…. You can see what the cast looks like now after 25 years at that link. The film was celebrated at the Tribeca film festival today. So enjoy these next few links that discuss the one and only Goodfellas. Just like the character he played in “Goodfellas,” Ray Liotta sang like a canary Saturday at the 25th anniversary reunion for the mob classic. Capping the 12-day Tribeca Film Festival, actors Robert De Niro, Lorraine Bracco, Paul Sorvino and screenwriter Nicholas Pileggi more than amused a Beacon Theatre audience with behind-the-scenes tales from the beloved flick, which opened in 1990. But it was Liotta, who played mob informant Henry Hill, who truly spilled the beans, telling a rapt crowd that Joe Pesci’s famous “Do I Amuse You” sequence was almost entirely improvised. Actually, that is not anything new as far as news…we all have heard about that tale from Joe Pesci before. Of the many delicious scenes in Goodfellas, the one that lingers longest is that of Paulie Cicero slicing garlic with a razor blade. The three shared hugs at New York City’s Beacon Theatre on Saturday night, along with Robert De Niro and Lorraine Bracco, for the 25th anniversary of the Martin Scorsese gangster classic — a reunion that closed the 2015 Tribeca Film Festival and included about a dozen members of the 1990 film’s other cast and crew in the audience. That I have to say no…I can’t agree with that. Because what I saw, is what I grew up with. Sorry. The scene with the Mother and Tommy and eating spaghetti and talking about settling down…no, that is as real as it gets. Author and co-screenwriter Pileggi didn’t believe it was Scorsese calling him. In addition to celebrating the power of film, this year’s Tribeca Film Festival also provided an opportunity for all our esteemed fake news hosts to geek out over their favorite films. Colbert talked to his hero George Lucas about “Star Wars,” John Oliver moderated a lively Monty Python reunion, and last night, diehard “Goodfellas” fanboy Jon Stewart closed out the festival with a celebration of the 25th anniversary of Martin Scorsese’s iconic gangster film. Following a screening of a remastered print of the film at New York’s Beacon Theater, Stewart moderated a Q&A with stars Robert DeNiro, Ray Liotta, Paul Sorvino, Lorraine Bracco and screenwriter and “Wiseguy” author Nicholas Pileggi. Goodfellas buried Tommy DeVito in a closed coffin. The real Tommy D came to a more crushing end. SPOILER ALERT:This article is all about endings, but it is still has no finish. In Martin Scorsese’s classic gangster film Goodfellas, Tommy DeVito, played by Joe Pesci, gets whacked by John Gotti’s family in retribution for killing made man Billy Batts, played by Frank Vincent. Robert De Niro’s character “Jimmy the Gent” Conway gets the news in a phone booth which he pummels in a fit of rage. Scorsese got his dope from Henry Hill, who ratted out his friends to the feds and told all in a best-selling book called Wise Guy. In the movie, Tommy has to be buried in a closed coffin because he was shot in the face. Tommy DeVito is based on Tommy DeSimone, aka “Two-Gun Tommy” or “Tommy D.” Most news reports, including one of mine, are based on Wise Guy and the press reports surrounding the $6 million dollar Lufthansa heist at John F. Kennedy International Airport. The problem is, the Gotti crew had nothing to do with the death of DeSimone. Tommy wasn’t buried in a closed coffin. He was never buried at all. His body was never found. Pretty much everyone is familiar with Joe Pesci, either from his role in popular Christmas-themed children’s film Home Alone or his role in Martin Scorsese’s Oscar-winning gangster classic Goodfellas. He largely retired from acting in 1999, but starting today, you can see him on the big screen in Clint Eastwood’s Jersey Boys. Just one hitch: you’ll be seeing an actor (Joseph Russo) playing the character “Joe Pesci” rather than the actor Joe Pesci playing a character in the film. Jersey Boys the film is based on Jersey Boys the play, which tells the story of Frankie Valli and The Four Seasons from the group’s inception all the way through to (spoiler alert) the group’s reunion at the 1990 Rock and Roll Hall of Fame induction ceremony. Turns out, Joe Pesci actually played a not-inconsequential role in the formation of the popular doo-wop band. Growing up near Newark, N.J., young Pesci was friendly with Tommy Devito and the rest of the band and, according to the canon that the film presents, Pesci connected DeVito (the band’s behind-the-scenes leader at the time) with “Short-Shorts” writer Bob Gaudio, who would later write nearly all of the Four Seasons’ most popular songs. Now, according to the movie, DeVito works for Pesci. Yeah, that Joe Pesci. Small world, right? The connection doesn’t end there, though. Later, Pesci—the actor, not the Jersey Boys character, who was a real person but not played by Joe Pesci because real-life Pesci was already in his 60s by the time Jersey Boys the play arrived on Broadway in 2005—starred in Scorsese’s Goodfellas. His name in the film? Tommy DeVito. And in case that weren’t enough of an in-joke, at one point during Goodfellas, Karen (Lorraine Bracco) confronts Henry (Ray Liotta), and says to him, “”Who the hell do you think you are, Frankie Valli or some kinda big shot?” Valli, in addition to being the lead singer in the Four Seasons, also allegedly had ties to the Italian mob (as did DeVito), so there’s more than enough self-referentiality going on here. Anyhow, here’s the point: without Joe Pesci, we likely wouldn’t have The Four Seasons, Jersey Boys (the play or the film), Goodfellas or My Cousin Vinny. There are likely plenty more links to be made, but probably best to stop here before the universe collapses on itself. So….what do you know…ain’t that funny….funny how?